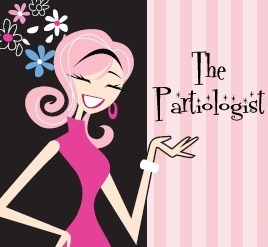 The Partiologist: Hawaiian Lei Cake Pops! I almost didn't make the Hawaiian lei for the luau. I really should have started with this, isn't that the way you are greeted once you arrive in Hawaii? 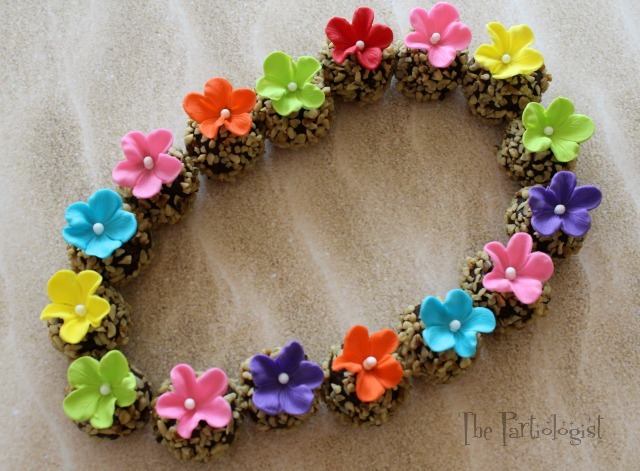 Or perhaps you could greet your guests with an edible Lei? Just make your cake balls the usual way, dip in chocolate and roll in chopped walnuts. I got carried away while making fondant hibiscus the other day, so I had extra and decided to make the Hawaiian lei cake balls. What a fun way to serve them, right? 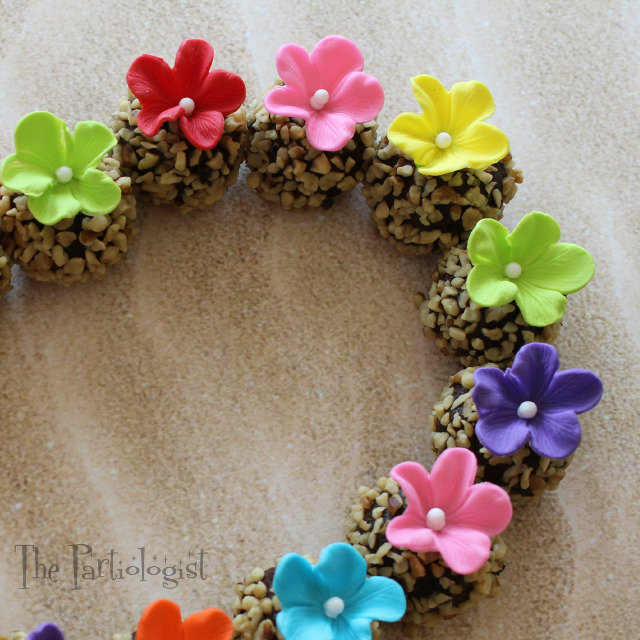 Not much more to say about this little lei, other than it could be even more Hawaiian if you rolled the chocolate in coconut??? Hmmm, why didn't I think of that? And wouldn't these be a special treat at a Hawaiian themed wedding? Let's get Maui'd and then get Lei'd. Wait??? Did I just say that? No, not me. It's almost time to hop on a plane back to the mainland. Almost... I've got one more treat from the Islands so stay tuned. So cute!!!! 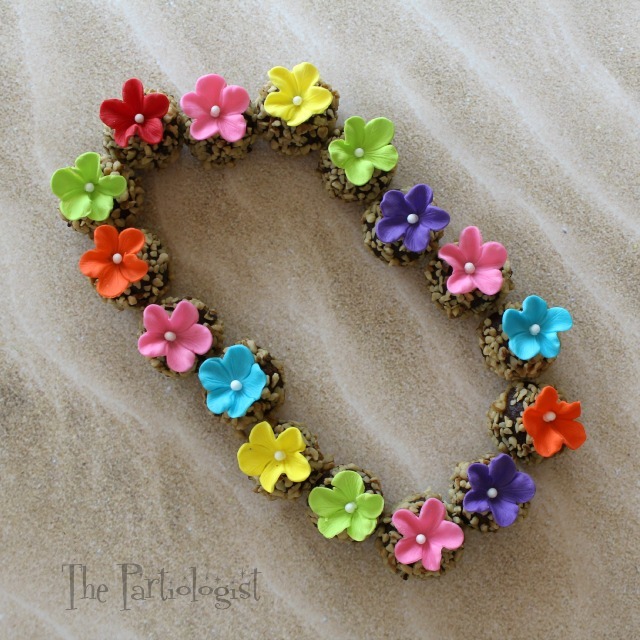 Perfect for a Hawaiian-themed party!!! Thank you Christine, I really should have had a party, right? I'm not ready to hope on a plane and end this fun trip to Hawaii. Let's stay longer! Aww, thank you, I want to stay longer too! YOU AMAZE ME WITH YOUR CREATIVITY!!! Thanks for sharing!!! Thank you so much, you're so sweet! LOL Never to Lei-t! ;) Love it!